Wreaths are an essential and well-recognized part of the holiday season; a staple in holiday décor, if you will. While small ones are available everywhere in the market before the holiday season, a Giant Wreath that stands out and draws attention isn’t so readily available. Even if you manage to find one, it can be of dubious quality that would hardly last through the season, much less bear repeated use. We at Downtown Decorations offer the perfect solution to this dilemma. All of our products, including our Christmas Wreaths, are of excellent quality. They are built to last for years and can withstand repeated use. Our products ensure that you won’t have to experience the hassle of finding the perfect wreath every year; just take a look at what we offer before you make the decision to buy. Our Large Outdoor Wreaths are very resilient and will last for several years. They’re made from fire and UV resistant materials that ensure they won’t be damaged easily. Your wreath would continue to look vibrant and green, despite long hours of exposure to sun and snow. Our products are lighter in weight but stronger than the traditional materials used. This ensures that not only are they safer and more resilient, but they’re also easy to handle. As they are relatively less heavy, and can be easily installed or removed from a high place without risk to the person performing the task. 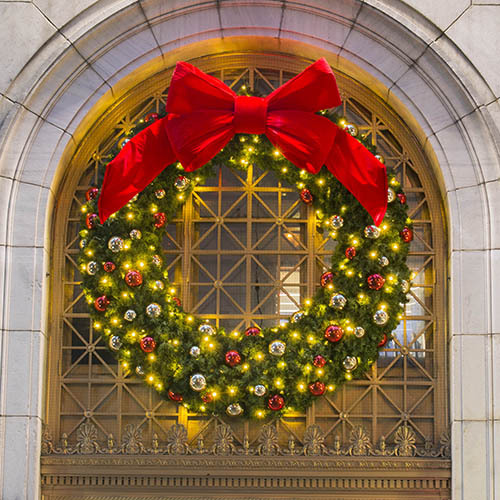 Commercial Christmas Wreaths need to be effortless to maneuver to best allow for quick installation and removal. Our wreaths are available with a wide variety of customization options and offered in sizes from 3’ to 30’. Additionally, a multitude of shapes are provided; if you are bored with the traditional round appearance, we can create diamond or square-shaped wreaths. We also provide different foliage options aside from our traditional Mountain Pine. Options include metallic or colored, boxwood or holly, mixed foliage, or long needle foliage. Regardless of the kind or size of Giant Wreath you require, we can custom build them for you. If you want to know more about Downtown Decorations’products and services, or wish to get a quote, please feel free to contact us. Just fill in this contact us form and we’ll get back to you as soon as possible. You can also call us at our Toll Free number: 877.369.6223 or dial 315.432.0646. We look forward to working with you soon!